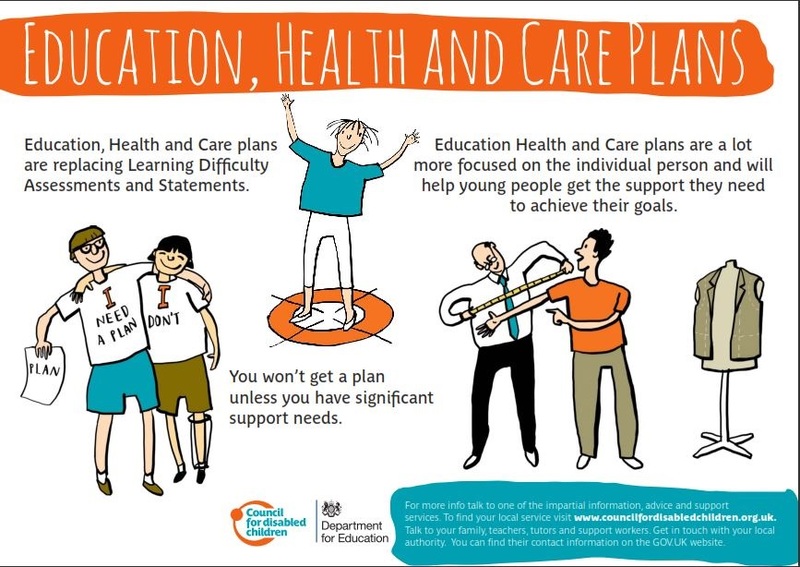 The Education, Health and Care Plan (EHCP) replaces the ‘Statement of Special of Educational Needs’ and can apply to children, young people and young adults from birth to the age of 25, providing that those over 16 are still in education or training. EHC assessments are undertaken and EHC plans drawn up under the Children and Families Act (2014) and associated regulations. The EHC Assessment (EHCA) will gather information and describe the child, young person or young adults’ needs, what outcomes we all want for your child/young person/young adult, what support is proposed to achieve these outcomes and who can provide that support. For children and young people who meet the criteria for a statutory assessment of SEN the Education, Health and Care Plan will also include all of the information which is currently held within the statement. The Education, Health and Care Plan will have the same legal status as a statement of SEN. There could be opportunities for you to have more choice and control about what support services your child receives through Personal Budgets. Your Lead Professional will be able to talk to you about this. Please note: Where we have provided templates for you to use as the basis for your own forms/documents, please be aware that you will need to ensure that you make them GDPR compliant for use in your individual settings. In considering whether to start an EHC assessment, the council will consider whether there is evidence that despite the early years’ provider, school or post-16 institution having taken relevant and purposeful action to identify, assess and meet the special educational needs of the child or young person, the child or young person has not made expected progress. • where a young person is aged over 18, we will consider whether the young person requires additional time, in comparison to the majority of others of the same age who do not have special educational needs, to complete their education or training. Remaining in formal education or training should help young people to achieve education and training outcomes, building on what they have learned before and preparing them for adult life. If an EHC assessment is agreed for your child/young person, a professional will be identified to be your Assessment Coordinator. They will be the person who keeps you updated on the progress of the assessment, or who you can contact if you have any questions throughout the process. An Assessment Team (involving staff from Education, Health, Nursery, School or College and Social Care Services) will work in partnership with you and your child/young person. They will gather information by listening, bringing together information from previous assessments and if needed, arranging new assessments. When all of the information is gathered, everyone who has been involved in the assessment stage will agree with you the support needed for your child/young person to achieve what they want from life. This will be recorded in a proposed Education, Health and Care Plan. The process from applying for an EHC assessment to sending out a final EHC plan should take a maximum of 20 weeks. Your Lead Professional will be responsible for overseeing and arranging reviews of your child/young person’s EHC Plan. This will normally be the SENCO at your child’s school or college. The reviews will happen through a meeting, which you will be invited to alongside all of the services and professionals involved in your child’s plan. They will happen at least once a year or more frequently if your child has very complex needs or circumstances change. All existing Statements and Learning Difficulty Assessments (LDA) will be turned into EHC plans by 2018. We will use the annual review of your child’s statement as the way in which we will turn the statement into an EHC plan – we will not make you go through two processes in the same year! We will give priority to children in years 2, 6, 9 and 11, so it may be that your child’s statement may not be turned into an EHC plan until they reach that school year. These are years when children and young people face the end of a Key Stage and/or a change of school which is why they have been given priority. For those young people over 16 who have an LDA, we will turn these into EHC plans before September 2016, if you are still at school or in college. You can complete the Request for an EHC Assessment or a professional can apply on your behalf with your consent. The application process asks for information about your child/young person, their strengths, their needs and reasons for applying - including details of services already involved in supporting you and your family. If you would like support or advice about how to complete the Request for EHC Assessment form, please contact the Information, Advice and Support service on 0300 303 2677.